Step 1: You will need several people to help with this project. Crafting doesn’t have to be a solitary activity, and this project’s success is especially contingent on the participation of a crafting community. Step 2: Drink. A lot of drinking will be required. The entire crafting party will need to consume, on average, quantities of cheap alcohol that is comparable to the weight of an African elephant. The variety of booze is left to the discretion of the crafters. My crafting party preferred the thirty case of Pabst Blue Ribbon, as it only costs $16, but Canadian Hunter whiskey and Banker’s Club are also viable options. Step 3: Move to the table. It doesn’t have to be a table; it can be a desk or a cabinet. It could even be a couch. 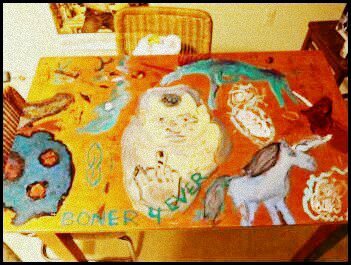 The kitchen table just seemed like the perfect canvas. Step 4: Pick a theme. An overarching theme for the table will create a more visually cohesive end product. Our theme was zombies versus unicorns with an omnipresent specter of Orlando Bloom presiding. Halfway through the project, we switched up the battle scene to include doodles from a sixth grade notebook. Step 5: Proceed with painting. Each crafter picked the side they wanted to paint and executed it to the best of their abilities. It is best to use acrylic paint and paintbrushes, but water colors and hands work equally well depending on what you are trying to portray. Voila! You have a lovely table that is both functional and a great conversation piece.